This is taking place months before the current events. The owner of a Turkish restaurant (Umit Celebi) is applying the final touches on a dish for Alexandra (Sigourney Weaver). He brings Alexandra her meal and waits anxiously for her verdict. Alexandra: “Please tell your wife she makes it better than they did in Constantinople.” He politely corrects her, “I think you mean Istanbul, ma’am. Constantinople is it’s ancient name.” Alexandra smiles, probably thinking that was its name when she was there. The White Hat man whose name is actually Sowande (Babs Olusanmokun) comes in and tells her, “The Black Sky. We have it.” They later arrive in a warehouse with Elektra’s (Elodie Yung) body lying on a table. They unwrap the gauze Elektra is in and rewrap her in red silk. They place her in a big jar and pour blood into the container. She later awakens, screaming and covered in blood. She is scared, confused, and feral. Alexandra steps forward to comfort her. Alexandra: “This is your home now. We are your family. I have waited so long to meet you.” Elektra tries to attack Alexandra but she easily subdues her. Elektra is eating and Alexandra explains what happened to her. Elektra has forgotten most of everything she knew. Alexandra continues, “And what you saw on the other side…the darkness, the absence of everything…it’s horrifying, isn’t it? I have seen it too. More than once and all I want in this life is never to see it again.” Elektra tries to ask who she is. Alexandra: “You are everything.” Elektra begins her training as the Black Sky. She goes to a rack filled with weapons and picks one, Alexandra tells her it is a good choice and reminds her; she is the weapon. A training montage begins. She begins with one man and beats him; it increases to three men that she beats. Now she is fighting a bunch of men and she defeats them. Alexandra declares her ready and a roomful of men with swords appear. They turn off the lights and an unarmed Alexandra fights them. When the lights come back on, she is holding two swords and all the men are dead. Matt Murdock (Charlie Cox) tells Jessica Jones (Krysten Ritter) who he is; Jessica guesses that Jeri Hogarth’s firm hired him. Jessica: “I didn’t know she did diversity hires.” Matt tells her he is an independent attorney. Jessica doesn’t want him to represent her and she will get her own lawyer. Matt tells her he’s read her file and know who she is and what she’s capable of doing. When he mentions Kilgrave, Jessica shuts the conversation down. He asks her if there is anything weird about the case, she denies anything is out of the ordinary. Matt informs her the police have nothing on her, she is free to leave. Jessica immediately leaves; once she’s in the hallway she calls Malcolm to see if he’s all right and to find out what he told the police. Matt uses his super hearing to eavesdrop. Jessica goes over to Michelle Raymond’s (Michelle Federer) home to talk to her. She asks the widow some questions and tells her, “I think someone was targeting him,” but she won’t go any further with her. Michelle doesn’t know anything. When Jessica is leaving, she spots Lexi (Chloe Levine) sitting forlornly on the stairs and tells her she is sorry about what happened. As Jessica walks down the sidewalk, she suspects someone is following her. She is correct because Matt is trailing her, listening to her footsteps amongst all the noise surrounding him. Jessica is able to turn the tables and now she is following him. Matt realizes he has lost her and hurries into the alley. Jessica sees him parkour out the alley; she takes some pictures. Her phone rings, someone is calling for Ms. Asher. Pretending to be Ms. Asher, Jessica speaks to one of the architects at the architecture firm John Raymond worked at. She pretends to be a potential client, she wants to see the most up to date designs, and is able to trick the architect to show her John’s last project, Midland Circle. Luke Cage (Mike Colter) is getting some ice for his jaw when Claire Temple (Rosario Dawson) walks in. He fills her in on everything that happened with White Hat, and Cole being arrested. Luke feels guilty he left Cole. Claire is glad he’s not in jail too. When they kiss, Luke wenches in pain. He tells her a dude clocked him. He describes Danny and says, “He had this hand…I think it glowed.” Claire knows who it is and picks up the phone to make a call. A little later, Claire and Luke are at the dojo with Colleen Wing (Jessica Henwick) and Danny Rand (Finn Jones). Both men have questions. Danny: “He punched me.” Luke: “You punched first.” Danny: “How come he can’t be hurt?” Luke: “What’s the deal with that fist?” Danny and Colleen try to explain Danny living in the mystical city of K’un-Lun and learning to control his chi, earning the title Iron Fist. They explain the criminal origination the Hand, but lose Luke when they say the Hand can bring people back from the dead. Claire reminds both men that they trust her and that they are both on the same side. She and Colleen will leave them alone to talk. The two talk about the experimentation they did on Luke in prison, resulting in his powers. Luke asks Danny about chi and Danny explains it as an energy source. Danny tells Luke about the dragon, and he laughs. Claire and Colleen hope the two will get along. Their hope is short lived. Luke is upset about the way Danny handled Cole. Danny doesn’t see the problem, the Hand is evil and Cole works for the Hand. Luke says that Cole is just trying to feed his family. He’s in jail now. Danny doesn’t care, he points out that Luke wasn’t arrested. Luke says not this time, “but I’ve seen my share of injustice.” Danny tries to explain that the man in the white hat is just the beginning, Luke isn’t thinking of the big picture. Luke accuses Danny of only thinking of himself. Danny angrily says, “Hey! You know nothing about me.” Luke: “I know enough. And I know privilege when I see it. You may think you earned your strength, but you had power the day you were born. Before the dragons. Before the chi. You have the ability to change the world without getting anybody hurt.” Danny: “These people won’t be stopped that way.” Luke: “You’re taking the war to the ones at the bottom, is that it? If I were in your shoes, I’d think twice about using that thing on people who are trying to feed their families.” Danny looks stunned, the truth hurts. Danny steps out of a limo in front of Midland Circle. He introduces himself and tells the receptionist he needs to speak to the CEO of Midland Circle Financial. He goes up in the elevator and walks down a white hall to the boardroom. He introduces himself to them and confronts them. Alexandra walks into the room and informs him she is in charge. She asks him to continue. Danny: “Rand Industries has put together a case to bring you down, extortion, narcotics, human trafficking. There’s no end to what we’ll uncover.” Alexandra is sitting at the end of the table and says, “And.” Danny continues, “There is nowhere for you to hide.” Alexandra tells him she appreciates his candor, but they aren’t hiding. She then asks him with a smirk, “K’un-Lun how is it these days?” Danny gets furious but a woman with a gun sneaks up on him. He takes the gun from her and there is a gunshot. Jessica walks into Midland Circle and Matt grabs her arm. Jessica: “If you grab me like that again, I’ll punch you so hard, you’ll see.” Matt tells her he’s been there before (the big hole from Daredevil season 2) and he tries to persuade her to leave. He hears a gunshot from the penthouse (Jessica doesn’t hear it) and grabs her scarf to hide his face and runs up the stairs. She takes the elevator. We all finally got what we wanted, the four Defenders meeting and fighting as a team. It was everything we could have hoped for. The team fought together and exchanged funny quips, especially Jessica. Everyone came to play, and it was fun to watch it. As a team they are a force; when Alexandra had Danny in the board room by himself, she seemed quite confident of the outcome. Now with the other three joining him, she isn’t controlling the game any longer. She is still dangerous, but now she has some dangerous opponents. The episode spent a significant amount of time on Alexandra. They have hinted in the previous two episodes that Alexandra is old. This episode confirmed it, we know she has been brought back from the dead more than one time, she was in Constantinople before it became Istanbul, she probably knew Brahms and Beethoven. She is dying now and her fear of death will make her do anything, and probably make mistakes she normally wouldn’t make. She has an interesting relationship with Elektra. It’s maternal and manipulative. Elektra is a weapon that she has a lot invested in. For most of the episode, the Defenders were divided in two pairs, Jessica with Matt, and Luke with Danny. Jessica was her usual ill-tempered self. She could tell Matt was hiding something, so she was wary of him. More time was spent on developing the Luke and Danny relationship. That makes sense since they are Heroes for Hire in the comics. They are complete opposites; two men who have had totally different life journeys. Luke’s comments on Danny’s privilege illustrated what Luke thinks of him, but what is more important, Danny actually listened and took it to heart. That shows that they can find common ground and develop a friendship. 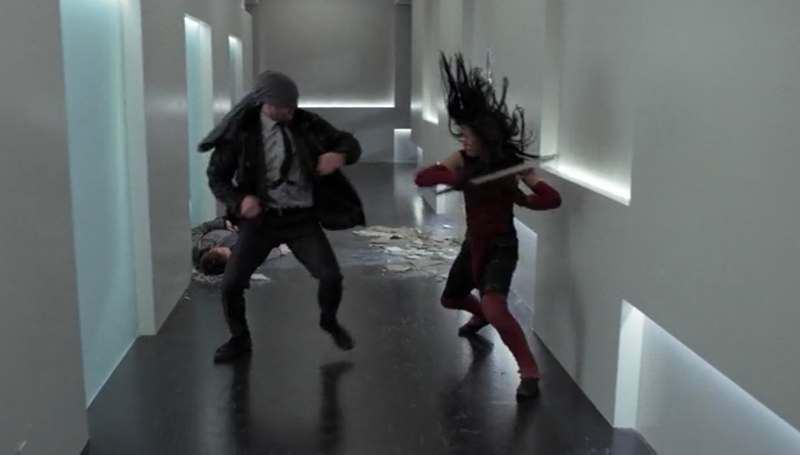 The fight scenes were fantastic, starting with Elektra’s training montage to the hallway fight. It was fun watching the Defenders different fighting styles complement each other. Luke and Danny showed that when Danny was able to use Luke as a shield when the Hand was firing machine guns, and then springing out from behind him to attack. My favorite fight scene was between Elektra and Matt. Their fight was well choreographed. I can say the same for the other fights. The fights along with the team’s interaction was what I hoped the Defenders would be.